It takes a finely-tuned sense of style to know how to layer cozy coats, cardigans and long-sleeved tees into one functional yet fashionable ensemble during the winter months. While I'm not a fan of cold weather, I'm most definitely a fan of cold weather clothes. More layers equals more opportunity to experiment with different colors and prints – like camel mixed with dark jeans or chambray paired with beige (Keep scrolling to see what I mean). Keep reading to freshen up on Coats 101 and learn how to style them for an office-perfect look. Then, browse the items shown below to tailor your wardrobe based on your own workwear style. Also known as a poncho coat, this classy outerwear option is named for its cape-style draped figure. The cape coat is often fitted with bell sleeves and a flared hem to accentuate its oversized design, with the addition of buttons, buckles and belts allowing you to shape it as you please. All Women's Talk says, "Cape coats are the best option to polish a casual outfit." Calvin Klein's Hooded Toggle Cape Coat, seen above, is proof in point. Match the look by pairing a neutral-colored coat with your favorite dark blue or black jeans. Ditching the outerwear once your lunch break arrives? AWT suggests light layers underneath, like a "long sleeved blouse in a complimentary color." First used as a winter shield by 18th century mariners, the peacoat has stood the test of the time and spanned its influence o'er land and sea to earn its place in the wardrobes of women everywhere. The style is characterized, at least traditionally, by large lapels and double-breasted fronts enclosed with buttons or toggles, like the Celebrity Pink Hooded Toggle Peacoat seen here. Honor the classic coat – which is also known as a pea jacket or pilot jacket, by the way – by sporting it with other timeless pieces. Refinery29 says "a classic white button-down and chunky boots" will do the trick. This cozy quilted look is cold weather fave due to its lightweight fill and "friendly price tag." 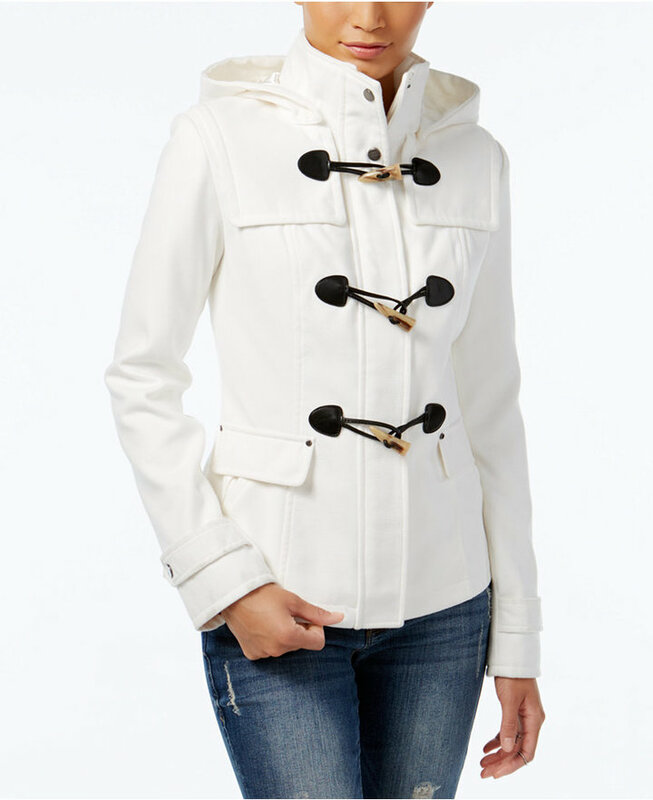 Puffer coats come in a few different fabrics but are known for their sleek nylon exterior. Most puffers are made with a synthetic polyester or poly-blend core, which is a popular alternative to the heavier-duty and loftier-priced feather down. WhoWhatWear encourages puffer-lovin' ladies to opt for fitted styles that "[expose] the waistline," like the Faux Fur-Trimmed Short Puffer Coat from Calvin Klein pictured here. Yet another combat-era staple that's come to stylish fruition is the trench coat. Made famous by its use in the muddy trenches of World War I, the style was adapted from the waterproof outing of raincoats and outfitted with straps, rings and other attachments to carry soldiers' gear. InStyle gives the trench coat a solid approval, noting how it "[radiates] polished sophistication and It-Brit cool." What's the secret to pulling it off? Don't try too hard. In extra chilly weather, "layer it over another warmer jacket like a bomber, a cropped fur, or even a jean jacket," says StyleCaster. "To pull this look off with aplomb, make sure that your trench falls right below your knee." This hooded trench by London Fog fits the bill. As the name suggests, a wrap coat is secured by a fabric belt wrapped around the waist. It resembles a cardigan or shawl and can usually be identified by its billowing lapels. Unlike the also belted cape coat or trench coat, the wrap coat is almost exclusively made from soft, insulating fabric like cashmere, fleece and tweed. This belted wrap coat from T Tahari, for example, is made from a wool and polyester blend. Make this practical piece pretty by with elegant touch-ups that don't overwhelm. Today.com suggests taming the accessories and opting for a clean color palette that compliments the coat. "A monochromatic ensemble will always work well."